The latest low-profile update to Corsair’s K70 range is the first change to the classic keyboard that genuinely adds to it. And that honestly means the finest gaming keyboard has actually just gotten better. The Corsair K70 is my favourite gaming keyboard, and has been since I first laid digits on its curved keycaps many years ago, back when my words were still being printed on paper. It wasn’t the first board to sway me towards the light, towards mechanical switches, but it packaged them in such a complete form nothing else could compare. In the intervening years it has become the standard by which all new boards are judged and has spawned itself a whole generation of impersonators. 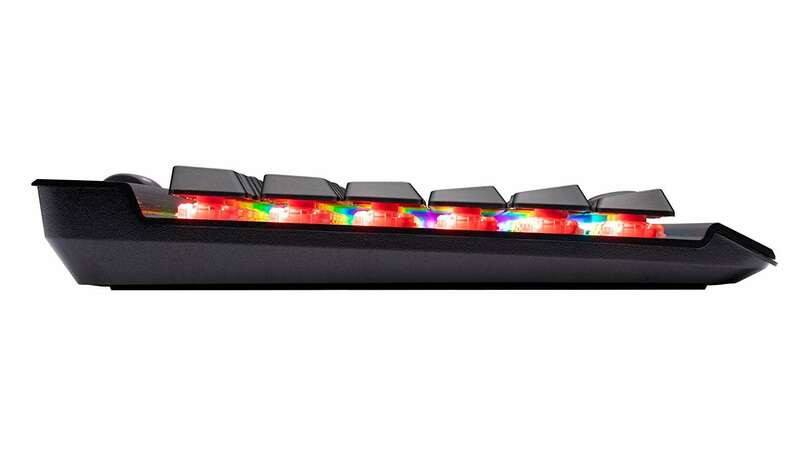 But the K70 RGB MK.2 Low Profile is different. This is a genuine change for the better and makes the K70 more comfortable and more accessible at the same time. And it’s the Corsair-exclusive Cherry MX Low Profile Speed switches that are making this board stand out against the mass of other gaming keyboards out there right now. 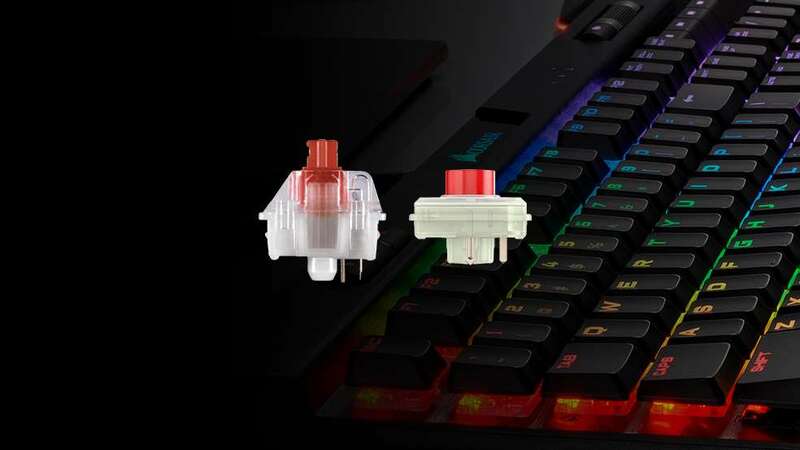 The low-profile RGB switch is 35% lower than the classic Cherry MX mech switch, providing a more easy-going positioning for your hands during all-day use. For nerds like me, strapped perennially to my desktop, with only the occasional break for vittles and evacuations, that’s an important change. The traditional mechanical switch has a much greater travel and longer actuation point than the latest low profile switches from Cherry. The classic MX Red has a full travel distance of 4mm and a 2.2mm actuation point, where the new MX Low Profile RGB Speed has a 3.2mm travel and just a 1mm actuation. That all means the older key has to move a relatively long way before the press is identified and, over time, there is the chance that can get tiring. There are a lot of folk who don’t get on with mechanical switch keyboards for that very reason, RSI or not, and that’s where the shorter, faster keys come into their own. The newer switch will almost activate the instant you think about depressing the key. It’s not exactly a chiclet keyboard, but the new K70 MK.2 Low Profile is considerably more slimline than the standard Corsair K70 MK.2 and that alone could tempt more people to ditch their comfortable, spongy, membrane switch board in favour of a genuine mechanical option. To all intents and purposes this low profile switch is analogous to the taller Cherry MX Speed. It too is a linear switch, so has none of the gritty feel of Browns or the tactile bump of Blues, and more like a hair-trigger Red switch. In fact this low profile version has even more of a hair trigger than the Speed switch as it has an even shorter actuation point. It’s only by 0.2mm, admittedly, but the quicker the board knows you’ve pressed a button the better, right? There is maybe a slightly more hard going feel to the low profile switches’ actuation when you get it out of the box, a certain resistance that takes a little while to clean off the fresh switches. But once you’ve used the board over a little while those edges get smoothed off and it becomes a joy to use. The actual frame of the latest K70 is lower too, with the total height of the low profile version 11mm shorter than the traditional mechanical switch version. 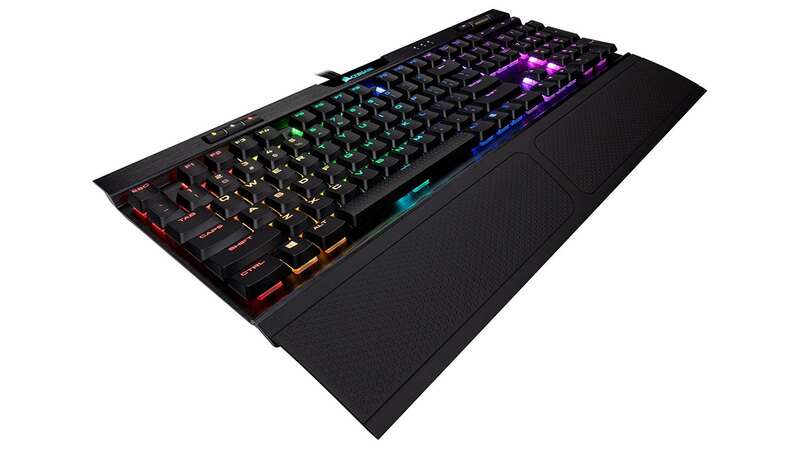 But it’s still got all the great design elements of the K70, which means you get all the discrete media keys and the robust volume wheel, as well as a black anodised aluminium frame to make it one of the most solid gaming keyboards on the market. Because of its shorter stature, however, it doesn’t have the same X-shaped cable-routing as the standard K70 MK.2, but that’s no great loss. I’d rather have the low-slung design than deep grooves I’m unlikely to ever fully use. 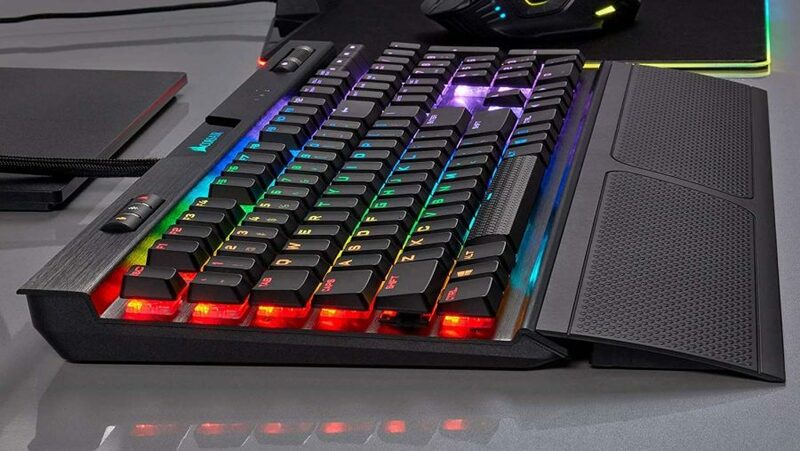 With its premium price tag – it’s a rather staggering $160 (£177) – I’d maybe hoped Corsair might have updated its wrist rest to ape the glorious padded options Logitech and Razer have started supplying, but the soft-touch rest is about adequate if nothing else. For that money you’re going to have to absolutely know you definitely want a slimline mechanical board, however. This new design, and its exclusive mechanical switches, don’t come cheap and it’s that lack of height that you’re paying for. But the sky-high price is my only real concern with this rather lovely little board; there are other K70 keyboards, with the same – though taller – feature set, same aesthetic, and all for a much lower price. That’s missing the real selling point of the K70 RGB MK.2 Low Profile, however. This is one of the first mechanical switch keyboards that combines the shorter travel and lower profile of membrane boards, with the feel, accuracy, and longevity of a mech. And that’s why you pay the big bucks. 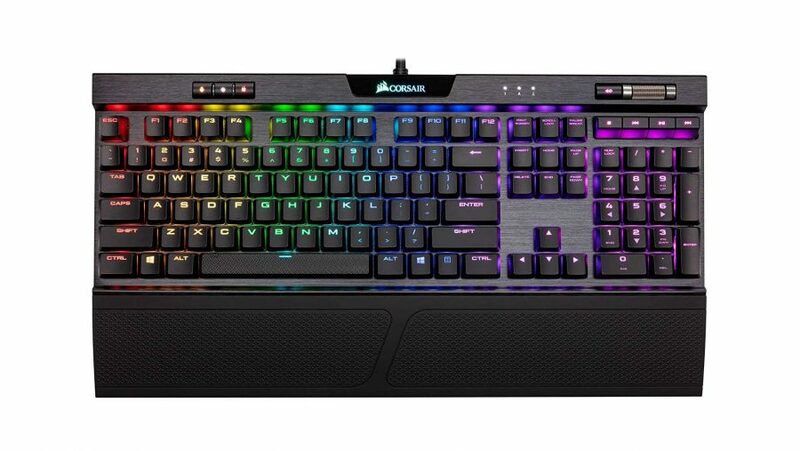 Corsair has taken its classic K70 design, jealously hoarded all the finest low profile mechanical switches around, and created the best version of its famous gaming keyboard yet.